Today, I came upon a vision of rotted out tube TVs and reverberating VCRs and a record popped out in a digital format. That record was The Lice's Proto-Rot "87-45" from sunny Long Beach, California. This album is not very sunny despite that weather. A lurking gloom haunts these tracks from beginning to end. The cover of Proto-Rot "87-45" is almost perfect. I love the pfotocopier-esque image of nurses with flittering moths the size of a human head. The purplish tone and the blue lines enhance this video fantasy further. The text is weak though - it's basically just written on, and it's kind of sloppy, especially the band name. I just wish it was a little neater. 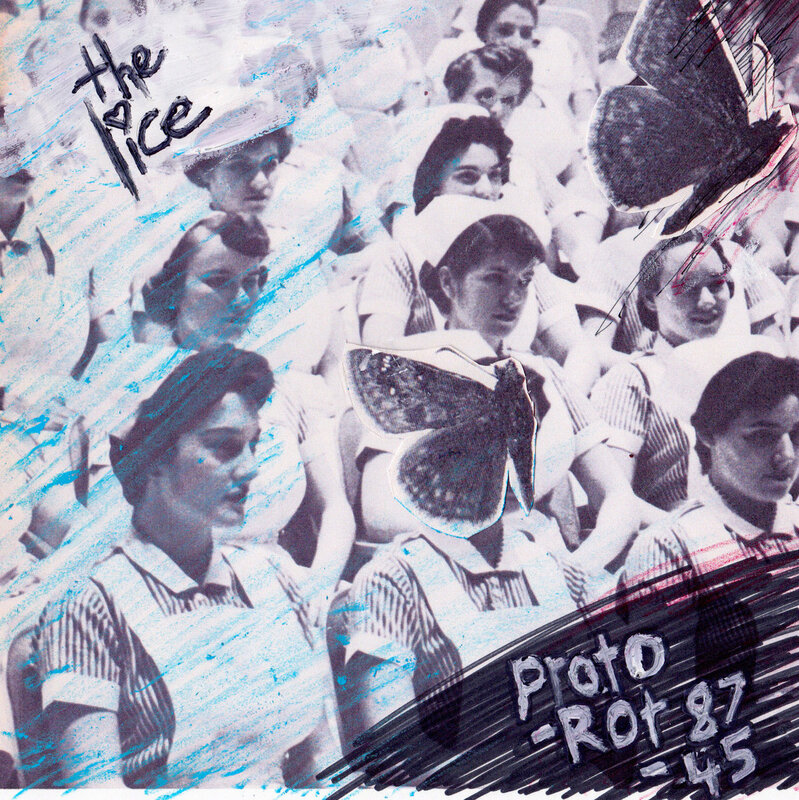 Proto-Rot "87-45" by The Lice The first song on this rotten thing is "Hiding 4 Kicks"; it's a perfect start. The waves of static mystery had me dreaming in the back of my head. I can't make out the lyrics really, but I love the droning guitar and beat and whirring vocals. The reverb soaks this to near static. The next track is the instrumental "Runout Runt", another looping beat, this time with a musick box melody on top and more metallic devices happening somewhere in the edge of the echo. It's very nice. "Dream on the Brat" is like a Ramones reference that has a slight Ramones style. The fuzzy reverb means I can only really make out the titular chorus, but I very much enjoy this song. It reminds me of Sonic Youth on Master=Dik. "Muzzled in Fuzz" follows with some really glitchy guitar-ing further into dreams. The final track, "Andy M.", starts sounding like it might be some trap rap stuff, but there is no rapping here, just more ghostly vocals. It's over in under a minute. Proto-Rot "87-45" is such a cool album. The production on this short songlets makes them like strange sequences in a dream that you want to visit again and again, falling asleep with the TV on to awake into some strange realm of infomercials that you never intended to see and only saw in the dim hours of almost no awake. Even though I can't make out the words too much, that works with the weird aesthetic. Proto-Rot "87-45" is one of my favorite albums this year. It receives a Good.